Quantum entanglement plays a key role in research into the quantum structure of spacetime and black holes. Entanglement means that the quantum characteristics of two parts the quantum system are strongly related to each other. Scientists measure the degree of entanglement by determining the value of the entanglement entropy. If the vacuum state of the spacetime is divided into two parts then the entanglement entropy of the spacetime is found to have a universal value. This value is equal to a quarter of the surface area of the separating wall. The existence of this quantum entanglement is an important condition for the continuity and regularity of spacetime. This new insight has led to a heated discussion about the nature of the event horizon of a black hole. When a pair of particles arises from the vacuum near such an event horizon, one of the particles can fall into the black hole while the other escapes in the form of radiation. Through this Hawking radiation the entanglement entropy of the black hole seems to increase. At the same time the black hole loses energy, as a result of which the area of its event horizon decreases and hence it reduces its quantum information. In a recent article American researchers argue that the tension between the increasing entanglement on the one hand and the decreasing area of the event horizon on the other (and therefore reduced information) leads to the paradoxical conclusion that the event horizon is not a regular part of spacetime. Researchers from the FOM programme 'A String Theoretic Approach to Quantum Matter and Cosmology' have played an important role in these developments. In a series of articles (1, 2, 3, 4) the researchers have demonstrated that the entanglement between a black hole and the outside world can be used to reconstruct the interior of the black hole, as a result of which the regular character of the event horizon is retained. Furthermore, in recent work the entanglement of a random area within the anti-de Sitter space has been calculated, and for the first time it was explicitly confirmed that this is the same as one quarter of the surface area. Both results are an important step forwards in the research into the quantum structure of spacetime. What happens with Schrödinger's cat if it jumps into a black hole? 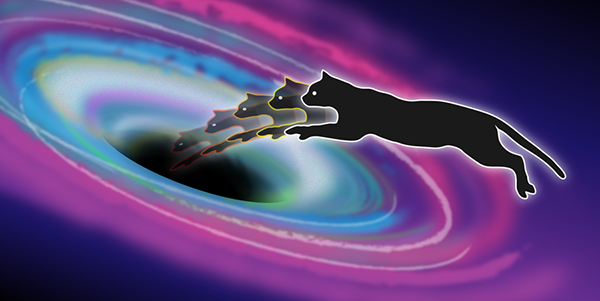 The current scientific discussion about quantum entanglement at the event horizon of black holes can be viewed as a continuation of older familiar discussions, such as the EPR paradox and the quantum measurement problem ('Schrödinger's cat') in the context of quantum gravitation.